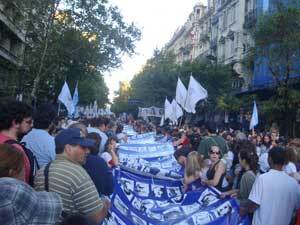 The Argentina Truth and Justice Memorial Day occurs every March 24th of the year. It honors those who lost their lives or disappeared in the process of overthrowing President Isabel Peron. To celebrate such an important day those who lost loved ones peacefully rally in the streets to share in each other's sorrow. While others lead marches throughout their city or neighborhood to honor the dead. The origins of such a sad day come from tragic beginnings as President Isabel Peron let military attacks be allowed to be aimed at left-wing activists, militants or socialists. Nearly 10,00 people were killed or disappeared to escape the discrimination of beliefs. Finally the President was overthrown and a new elected official lead the country with a much better manner.